Get the view of a lifetime. 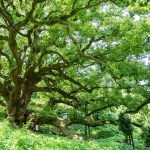 Located on the Shonai Peninsula in Mitoyo, Kagawa, Mt. 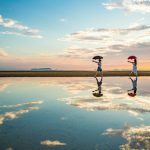 Shiude rewards those who travel off the beaten path. Seto Inland Sea spreads before you and the outline of mainland Japan beckons in the distance. Mt. Shiude offers ever-changing scenery that delights year-round. Included in Yahoo! 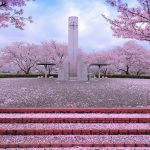 JAPAN’s 2017 list of Japan’s 15 Best Cherry Blossom spots and Places to Go Before You Die! 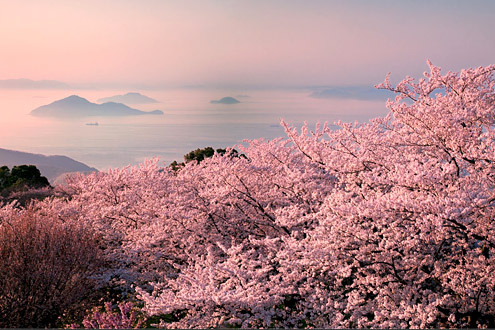 World Scenery: Japan Edition. Mt. Shiude’s name means “mountain of emerging purple clouds” and originates from the Legend of Urashima Taro, a popular Japanese folktale. Many people believe that the story took place around the Shonai Peninsula. According to the story, Urashima Taro was a fisherman who saved a turtle, and in return, the turtle carried him to a palace below the sea where he was entertained by a beautiful princess. Eventually, growing homesick, he told the princess of his desire to return to his home, and she sent him back after gifting him with a treasure box and instructing him to never open it. Urashima Taro returned to his village to find that many years had passed. Forgetting the princess’s instructions, he opened the treasure box- allowing a cloud of smoke to escape- and found himself transformed into an old man. It’s said that when Urashima Taro opened the treasure box, the escaping smoke formed purple clouds which hung over the mountain that is now Mt. Shiude, giving it this name. At 352 meters above sea level, the lookout point atop Mt. Shiude affords a view of numerous islands dotting the sea to the East, and a beautiful view of the comparatively empty sea to the West with mainland Japan visible in the distance. The Archaeological Museum displays ancient earthenware and stoneware items excavated on Mt. Shiude dating back over 2000 years. 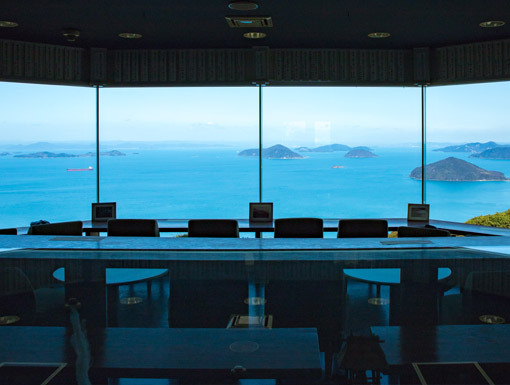 Inside the museum’s cafe, grab a drink, or just relax at the counter where the expanse of the inland sea unfolds below you. The museum offers visitors a matchmaking clam shell charm. It is said that the charm brings happiness when the shells are put together. 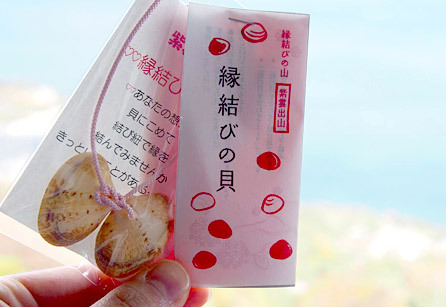 Many couples write their wishes on the shells and tie their charm to a nearby tree! Via Takamatsu: Get off the highway at the Mitoyo-Tossaka exit and travel about 45 minutes. Via Matsuyama:Get off the highway at the Sanuki Toyonaka exit and travel about 45 minutes. Change to Shonai Line (heading West) after 5 mins. The path up Mt. Shiude is very narrow in places and cannot accommodate large tour buses. Seasonal overgrowth of the path may also prevent passage by medium tour buses. Small- or micro-sized buses are recommended to ensure passage up the mountain. 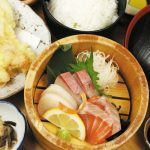 The fare for a round-trip taxi from Takuma Station is approximately ￥9,000. 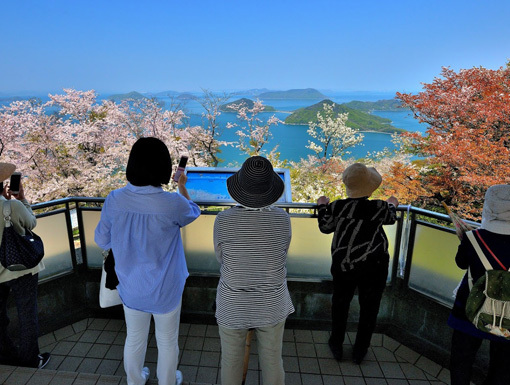 ★Handicapped or elderly visitors should contact the museum to reserve a space (excludes sakura season). Because of Mt. 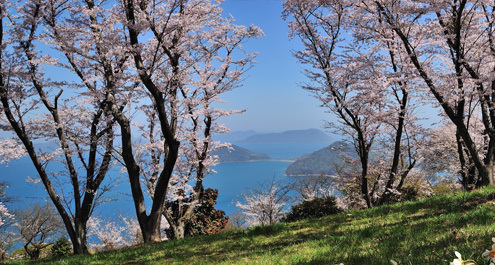 Shiude’s elevation, the cherry trees on the mountain can be expected to bloom approximately 1 week after the trees in the surrounding area. There will be no illumination this year. 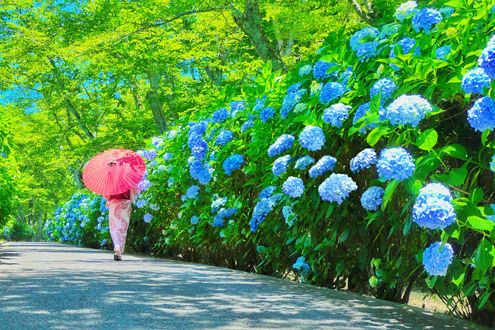 During the blooming period, the roads around Mt. Shiude will be incredibly crowded. For this reason, the route up the mountain will be closed to private vehicles during business hours for the duration of the 2019 viewing period. Please use the shuttle buses to travel to the mountaintop. Above is travel information for the 2019 season. Dates, etc are subject to change so visitors should confirm the latest information before their arrival. Dates are subject to change in accordance with the actual blooming period. The path up Mt. Shiude is very narrow in places and cannot accommodate large buses. Visitors arriving on a large bus should either change to a medium- or small-sized bus, or take the shuttle bus to the mountaintop. 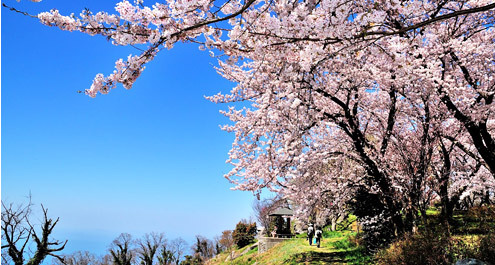 On weekends during Sakura Season, it can take 1-2 hours to reach the peak, so please make your travel plans accordingly. There is a travel fee for all tour buses entering Mt. Shiude. This fee is ￥4,000 per bus. Urashima Kanko offers a Mt. 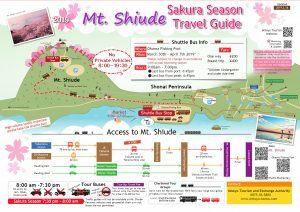 Shiude travel plan where visitors on large buses can change over to two microbuses. Anyone interested in their services can see this PDF (Japanese only) for more information. Outside of operating hours (8:00 am – 7:30 pm) traffic guides will not be available. Due to the narrowness of the road, buses are still not permitted up the mountain at this time. All others may enter at their own risk. Parking on Mt. Shiude is extremely limited. This year, in the interest of allowing access to as many people as possible, visitors are not allowed to take private vehicles up the mountain during operating hours. Thus, we ask that any early-morning or late-night visitors to Mt. Shiude remove their cars from the mountaintop parking lot by 8:00 am. (1) Due to Mt. Shiude’s status as a national park, open flames are not permitted anywhere on the mountain. 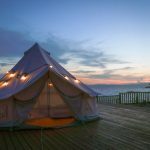 This includes – but is not limited to – barbecue grills, burners, and fireworks. (2) The use of drones will not be allowed on Mt. Shiude during or around Sakura Season for the safety and comfort of visitors. (3) Press and media photographers should contact the Mitoyo Tourism and Exchange Authority (0875-56-5880 or info@mitoyo.org) for permission in advance.